Europe and Asia or both? My accidental tourist spirit is willing, but the body stubbornly resists leaving Pacific Daylight Time. And this in spite of the full moon over Istanbul and the 80% humidity, or maybe because of it. Istanbul is a study in contrasts. It has a “European” side and an “Asian” side. I have never heard any of the locals refer to Istanbul, or Turkey, as the Middle East. I arrived in Turkey knowing that it was the Middle East, and now find that knowledge highly questionable. At the same time, there is Old Istanbul and new Istanbul. I am now in a hotel in Old Istanbul (and by the way, the Turkish spell the city with a small i) and enjoying it very much. This city is reminiscent of San Francisco in many ways: rolling hills, a bay, houses tucked into the hills, and lots of fish restaurants. The Bay of Bosphorus has two bridges that connect the European and Asian side, and they look a bit like the Golden Gate Bridge, although not painted red. The water in the Bay is a midnight blue with a very slight green tinge. 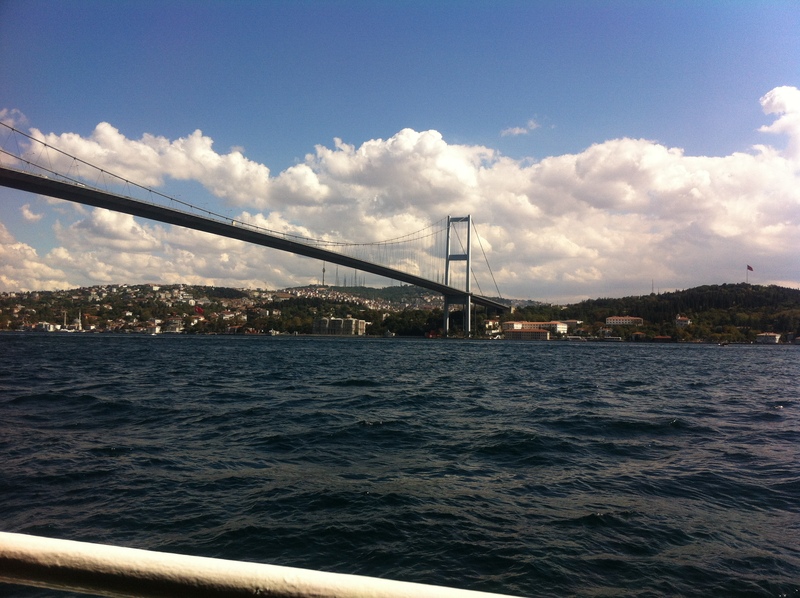 Bosphorus Bay, like San Francisco Bay, is filled with ferries of tourists, fishing boats and sailboats. On Saturday, I saw palaces, mosques, and even a fortress. The city’s population (20 million, I’m told) is largely Muslim, but there is a decidedly European and very western feel to things. At least half of the people I’ve seen, mostly men, smoke cigarettes. I haven’t seen this much smoking since the 1970’s. I’ve also seen a lot of beer drinking, and lots of Turkish women in skinny jeans, skimpy tops and uncovered heads. Everyone seems to be in a rush, and I believe there is lots of money to be made and spent. I’ve spent all of my time on the European side; hopefully, before I continue on to Saudi Arabia, I will see the Asian, and much less European, side of Turkey. This is good documentary. Take care..